Published 2/9/2012 . Last updated 9/15/2017 . I have to give credit where credit is due. 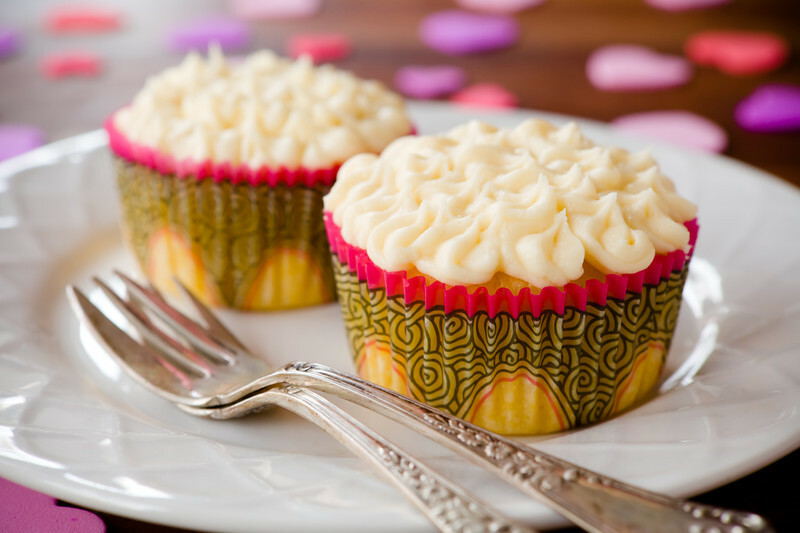 Jonathan came up with the idea for these passion fruit cupcakes for Valentine’s Day with white chocolate frosting. I mentioned that I was trying to think of something different for Valentine’s Day this year and he said, “Passion fruit!” I wasn’t sure about the idea at first – perhaps because I hadn’t thought of it (yeah, I’m like that sometimes). But, the idea grew on me until I had to get into the kitchen and bake them. The passion fruit cupcakes are unique and tropical and they express more than just a friendly, hand-holdy kind of love. This Valentine’s Day, take a trip to the tropics with these passion fruit cupcakes made with frozen passion fruit pulp and coconut milk, paired with a white chocolate buttercream. In a small bowl, combine coconut milk, passion fruit pulp, and vanilla. Set aside. Add eggs to the sugar mixture one at a time, beating well after each addition. Alternately add the flour mixture and the passion fruit mixture to the egg mixture, beating well after each addition. Whip butter in a large mixing bowl on high speed until light and fluffy, about three minutes. Mix in melted chocolate and salt. I love your recipes! I just wish I had easier access to some of the ingredients you use. There are so many (such as this one) that I’d love to try, but would have to mail order ingredients to do so. Tug’s – I know. I am so fortunate to have a fantastic international grocery store near my house. But, I know that not everyone is so lucky. I’ve had to mail order some items from time-to-time myself. Sometimes it’s not a big deal. It can even be cheaper than in the store and sometimes you can get free shipping. But, unfortunately, that isn’t always the case. These sound delightful! Also, I LOVE your cupcake liners. Where did you get them? Will the frosting work with white chocolate chips? Or is white baking chocolate required? love passion fruit every day of the eyer but on valentine’s day it is a must for me :) loved your cupcakes! In my country I can find fresh passion fruit easily, but it’s such a kind of fruit that is full of seeds. To remove all its seeds is not an easy job, so I think you’re really fortunate to have frozen passion fruit pulp in a grocery near you. Jessica – White chocolate chips would work fine too. How pretty and precious these are!! If I had more time tonight, I’m sure I would be brave enough to venture into the kitchen for something this wonderful. :) And I love the presentation! Texture was weird, taste was great… please tell me what what could have happened? HELP! Hi!!! Incredible recipe. Is it as delightfull as i think?? … Kisses. Love your blog! I just made the cupcakes, although they taste delish it is not what I expected… the batter sticks to the paper and they are super dense, they did not rise. Can I use half cup coconut milk and half cup of cream and or reduce the eggs and or add baking powder? Any help you can provide is appreciate it.